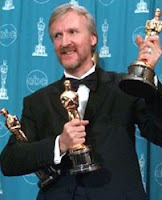 swench: James Cameron on "Perfcap"
Actors need not feel threatened by this change in technology. It doesn't replace acting, in fact it's designed to empower the acting and directing process, as opposed to the traditional [computer-generated] animation process, which uses only the actor's voice, and in which a committee of animators perform the character, operate the camera, and do the lighting. A committee of animators... Seems like he has no idea that most of Kong and Gollum and all of Davy Jones' facial performance was done by hand.